It was fun for me to recently share about a time I thought God might send us somewhere I didn't...really... (no REALLY)... DID NOT want to go. It was a few years ago, and Mark was working on submitting his resume within his company for a transfer. He had put in for a few jobs within the plant he worked in (because, that's what he IS, a Missionary in a chicken plant), but the doors were closed firmly, and he realized that he was going to have to look outside our area. Not ideal, but doable. God moves us, and we're cool with that. As quickly as my shame caught me off guard, I heard the Lord speak CLEARLY to my heart. "You would GO to China for me, but you wouldn't GO to North Dakota?" He saw my willingness to GO had some provisions. Not a good thing to have when it comes to obedience. You don't get to say where you're willing to have Him move you to...? Oh. duh. At this point, I'm fairly certain I was hiding my face in shame... it was so hard for me to admit to my selfishness and immaturity and disobedient heart. Again. Deep sigh. Humility at the reality of my hard, sinful, heart. "Yes. Lord. 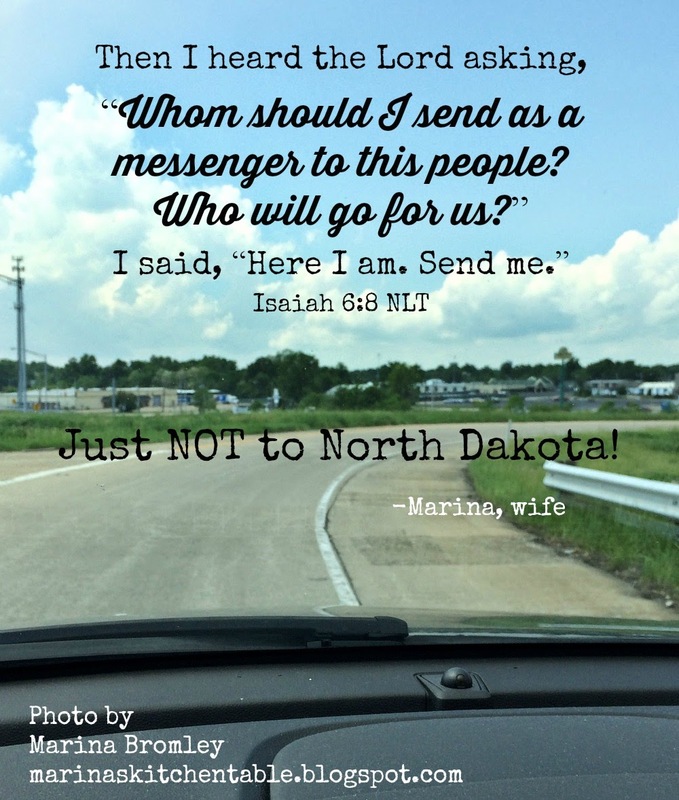 Here am I... send me ... even to North Dakota... if that's YOUR will." I'm sure I meant it, but for good measure He reminded me of other times I was not willing to GO where He wanted me to GO. Times I wasn't willing to serve where He asked me to serve. Jobs He wanted me to take, that I didn't apply for. Opportunities He opened doors for me to share, where I didn't lift my eyes to meet theirs, or open my mouth to speak Truth, or be Light. People He wanted me to visit, clothe, feed... that I ignored. I'm hoping my heart stays in check, and that I'm sensitive to His leading WHEREVER He wants to send me. I pray that I'll have enthusiasm, and joy, and peace, as He continues to lead me. Has God ever led you to a place you didn't want to be? Did you ever tell God "no" when He tried to send you? and help us to discern Your will in our steps daily, wherever it is You guide us. I pray that You'll help us to walk in obedience, no matter where it is that You send us... to our back yards, our next door neighbors, the streets of our cities, or to the ends of the earth, till the end of time.